IMF members have access to hundreds of published reports from IT industry leaders on a variety of topics at TheIMF.com. Cloud Experiences: Workloads Matter is based on an IT Finance Managers group presentation by Jon Birdsall, IT Finance Controller at IBM. 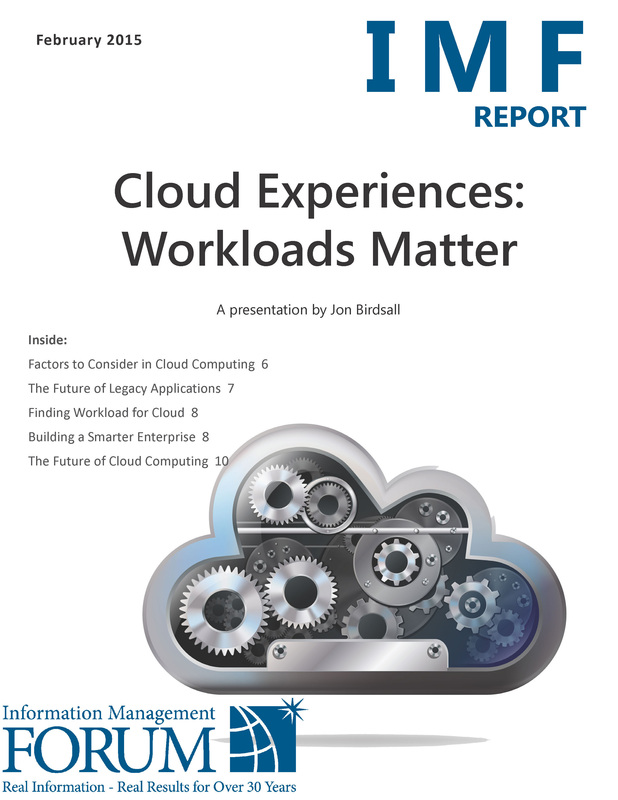 In this report, Jon discusses his organization’s internal work in the cloud, including cloud benefits for workload, the cost of moving applications to the cloud, and the transformation of the service portfolio to address new demand for applications using cloud-based solutions. Jon explores the future of cloud implementations for large enterprises, the use of private cloud implementations versus public cloud implementations, the adoption of infrastructure, platform, and software cloud models, and more. IMF members can view this report and hundreds of others by leaders in the IT industry by logging-on to TheIMF.com and visiting our Reports page. For more information or to learn about how to become an IMF member, please contact us at information@theimf.com.